Kinder Morgan’s Trans Mountain pipeline and tanker project poses unacceptable risks to our oceans and waterways, our climate, local economies and communities. It must never be built. First Nations have vowed to stop it in court. People, businesses, & communities are raising funds to support their court cases and stop this pipeline, together. 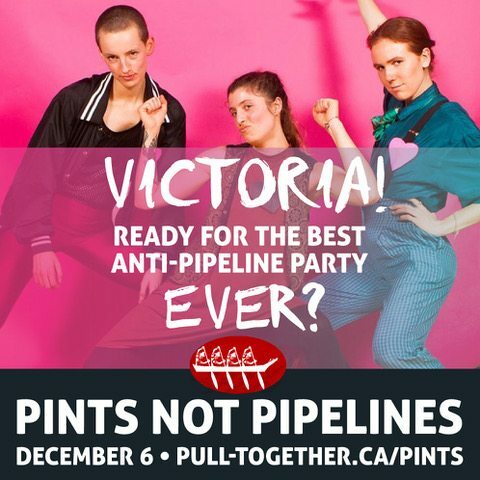 All admission and beer sales go directly to Pull Together: a fundraiser for First Nations lawsuits against the Kinder Morgan Trans Mountain tar sands pipeline. The event will be held at the Victoria Event Centre, on 1415 Broad Street downtown. Doors open at 5:30 for after work drinks and an open mic. The event will keep rocking late into the night for dancing, munching, sipping and shenanigans! Entry is $20 and includes THREE beer tickets!